When we shared about Picturing Heaven on Facebook, someone commented that it is blasphemous because it attempts to picture God’s dwelling place. I respectfully disagree. It’s true it is possible to blaspheme Heaven. In Revelation 13:6, we’re told that the satanic beast “opened his mouth to blaspheme God, and to slander his name and his dwelling place and those who live in heaven.” Our enemy slanders three things: God’s person, God’s people, and God’s place—namely, Heaven. Because Satan hates us, he’s determined to rob us of the joy we’d have if we believed what God tells us about the magnificent world to come. He’s the one who doesn’t want us to envision how beautiful and wonderful Heaven will be. But is it appropriate for us to discuss and even try to picture what Heaven will be like, based on what Scripture tells us? Yes, because what we otherwise could not have known about Heaven, since we’re unable to see it, God says He has revealed to us through His Spirit (1 Corinthians 2:10). This means that God has explained to us what Heaven is like. Not exhaustively, but accurately. God tells us about Heaven in His Word, not so we can shrug our shoulders and remain ignorant, but because He wants us to understand and anticipate what awaits us. We should accept that many things about Heaven are secret and that God has countless surprises in store for us. But as for the things God has revealed to us about Heaven, these things belong to us and to our children (Deuteronomy 29:29). It’s critically important that we study and understand them. That is precisely why God revealed them to us! Second Corinthians 12:2-4 is sometimes used as a “silencer” to discussions about Heaven. Paul says that fourteen years earlier he was “caught up to paradise,” where he “heard inexpressible things, things that man is not permitted to tell.” Some people use this verse to say we should not discuss what Heaven will be like. But all it says is that God didn’t permit Paul to talk about his visit to Heaven. In contrast, God commanded the apostle John to talk about his prolonged visit to Heaven, which he did in detail in the book of Revelation. Likewise, Isaiah and Ezekiel wrote about what they saw in Heaven. Although it’s inappropriate for us to speculate on what Paul might have seen in Heaven, it’s certainly appropriate to discuss what John saw, because God chose to reveal it to us. If He didn’t intend for us to understand it, why would He bother telling us about it? (When was the last time you wrote someone a letter using words you didn’t expect them to comprehend?) So, we should study, teach, and discuss God’s revelation about Heaven given to us in His Word. Certainly, not everything the Bible says about Heaven is easily envisioned. Consider Ezekiel’s description of the living creatures and their wheels, and the manifestation of God’s glory that leaves the prophet groping for words (Ezekiel 1:4-28). Still, many other passages concerning Heaven are much easier to grasp. We cannot anticipate or desire what we cannot imagine. That’s why, I believe, God has given us glimpses of Heaven in the Bible—to fire up our imagination and kindle a desire for Heaven in our hearts. And that’s why Satan will always discourage our imagination—or misdirect it to ethereal notions that violate Scripture. As long as the resurrected universe remains either undesirable or unimaginable, Satan succeeds in sabotaging our love for Heaven. Rather than ignore our imagination, I believe we should fuel it with Scripture, allowing it to step through the doors that Scripture opens. I did not come to the Bible with the same view of Heaven that I came away with. On the contrary, as a young Christian, and even as a young pastor, I viewed Heaven in the same stereotypical ways I now reject. It was only through years of scriptural study, meditation, and research on the subject that I came to the view of Heaven I now embrace. Scripture gives us images full of hints and implications about Heaven. Put them together, and these jigsaw pieces form a beautiful picture. For example, we’re told that Heaven is a city (Hebrews 11:10; 13:14). When we hear the word city, we shouldn’t scratch our heads and think, “I wonder what that means?” We understand cities. Cities have buildings, culture, art, music, athletics, goods and services, events of all kinds. And, of course, cities have people engaged in activities, gatherings, conversations, and work. We’re told we’ll have resurrection bodies (1 Corinthians 15:40-44). When God speaks of us having these bodies, do we shrug our shoulders and say, “I can’t imagine what a new body would be like”? No, of course we can imagine it. We know what a body is—we’ve had one all our lives! (And we can remember when ours looked better, can’t we?) So we can imagine a new body. In Heaven, we’ll rest (Revelation 14:13). We know what it means to rest. And to want to rest (Hebrews 4:10-11). Scripture speaks of a New Jerusalem made of precious stones. Some of the jewels listed in Revelation 21:19-21 are among the hardest substances known. They indicate the material solidity of the New Earth. The problem is not that the Bible doesn’t tell us much about Heaven. It’s that we don’t pay attention to what it tells us. Some of the best portrayals I’ve seen of the eternal Heaven are in children’s books. Why? Because they depict earthly scenes, with animals and people playing, and joyful activities. The books for adults, on the other hand, often try to be philosophical, profound, ethereal, and otherworldly. But that kind of Heaven is precisely what the Bible doesn’t portray as the place where we’ll live forever. John Eldredge says, “We can only hope for what we desire.” To this I would add a corollary: We can only desire what we can imagine. If you think you can’t imagine Heaven—or if you imagine it as something drab and unappealing—you can’t get excited about it. You can’t come with the childlike eagerness that God so highly values (Mark 10:15). I really love this coloring book devotional. 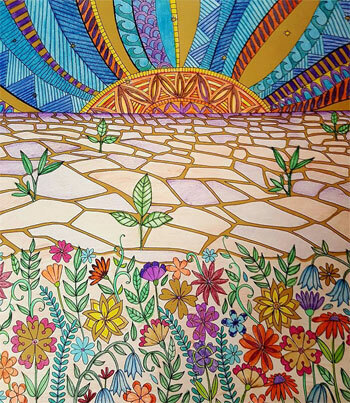 The coloring pages are really pretty and intricate and they inspire me to grow closer to God. I'm very excited about my Heavenly home as a result of engaging with this wonderful book. -S.